What is Healing of the Canoe? 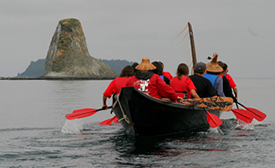 The Healing of the Canoe began as a collaborative project between the Suquamish Tribe, the Port Gamble S’Klallam Tribe, and the Alcohol & Drug Abuse Institute at the University of Washington. 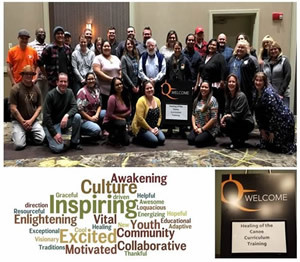 Suquamish and Port Gamble S’Klallam identified the prevention of youth substance abuse and the need for a sense of cultural belonging and cultural revitalization among youth as primary issues of community concern. In response, the Healing of the Canoe partnership sought to address these issues through the development of a community-based, culturally-grounded prevention and intervention life skills curriculum for tribal youth that builds on the strengths and resources in the community. The Culturally Grounded Life Skills for Youth Curriculum, created through this collaboration, is an adaptable curriculum for Native youth focused on substance abuse and suicide prevention. It uses the Canoe Journey as a metaphor, providing youth the skills needed to navigate their journey through life without being pulled off course by alcohol or drugs – with tribal culture, tradition and values as compass to guide them and anchor to ground them. The curriculum template is generic, allowing each community to adapt it to use their own metaphors for a successful life journey. lower levels of substance use. Despite the small sample size, this evaluation suggests that the community-derived, culturally-grounded prevention curricula represent promising practices. Consistent with the skills needed to successfully complete the Canoe Journey, the curricula have the potential of helping AI/AN youth stay on course as they navigate life’s journey. Citation: Donovan DM, et al. (2015). Healing of the Canoe: Preliminary results of a culturally grounded intervention to prevent substance abuse and promote tribal identity for Native youth in two Pacific Northwest tribes. American Indian and Alaska Native Mental Health Research, 22(1):42-76. Free online. Looking for Healing of the Canoe Training or Technical Assistance?